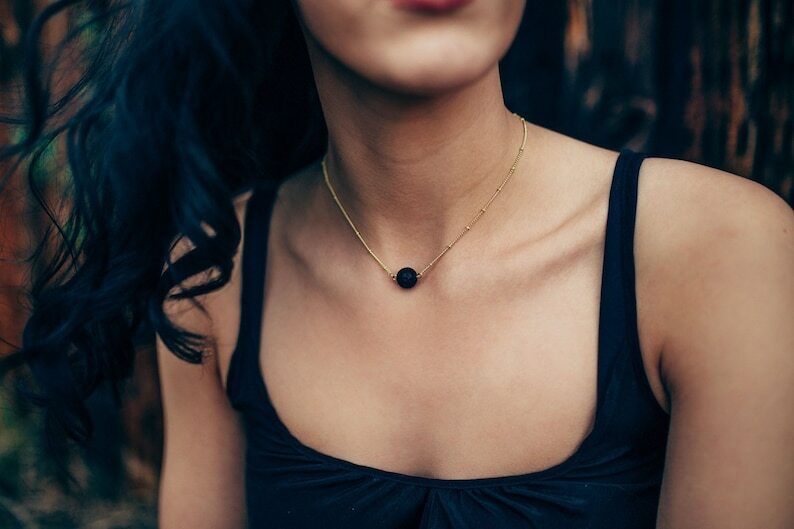 This necklace is not only beautiful but is made with a single lava stone which is a natural, porous stone that makes an excellent Essential Oil Diffuser. All the benefits of aromatherapy plus it's a gorgeous piece you'll want to where every day! Use this diffuser necklace to help you with anxiety, stay calm through the day, stay focused during a busy meeting , stay mindful during a meditation, or any other way you typically use your essential oils. Dressing up for a nice dinner or going to a professional setting or meeting. At the same time I love jewelry that is interesting and eye catching. And that's why I love my beaded detail chain. It's simple and dainty but different and gorgeous. I love using it with my designs. My essential oil diffuser line has grown and I truly love every piece. This single lava stone necklace is my first diffuser piece I designed and it's still one of my favourites and my best selling item. Such an easy piece to wear everyday. It's really lovely to have on. I love the scent level it gives off, not enough for others to be offended, but still enough for me to notice. Day does beautiful work and is a pleasure to deal with! Thank you! The necklace has arrived and I just love it. Thank you so much!